Join us to fight for all Granite Staters! It’s time for a health care system that puts people’s lives before profits. We need a Medicare for All insurance program that provides coverage for EVERYONE in New Hampshire and across the country. A program that includes dental, vision, hearing, and help for those suffering from substance use disorders. We no longer want private corporations deciding how much we pay for health care. 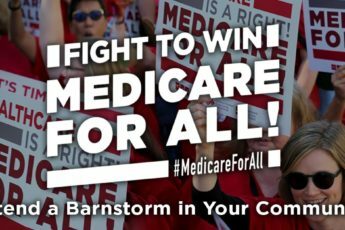 Under a Medicare for All plan the federal government will pay doctors, nurses, and drug manufacturers directly. This will save us $2 trillion in the next decade and help 80 million people gain access to the health care they deserve.